You’ve just purchased your new home in New Orleans. You’re excited, but kind of nervous at the same time. You need repairs done, but you want the best possible renovations at the fairest prices. You’ve settled on where to go for everything except your floors. Who can you rely on? Carpet Corner is your saving grace! Carpet Corner is a full-service carpet and flooring store in New Orleans that has serviced the Greater New Orleans region since 1974. It’s a trusted brand with top quality products sold at reasonable prices. We want the floor buying process to be as easy as possible. Not only is Carpet Corner the most reliable flooring store in New Orleans, but we love helping first time homeowners choose the floors that best matches their needs and wants. We understand that choosing the right floor is an important decision that needs to be made. It can be a little overwhelming and even a bit frustrating sometimes. Choosing the right floor is such a big decision because, unlike other things in your home, your floor is the one thing that everyone uses. 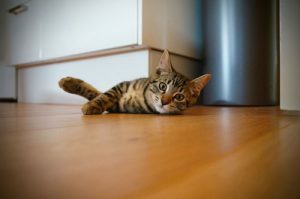 From the residents and pets that live there to the guests you invite over, walking on your floor is inevitable. Also, it gives your home personality and reflects your taste and lifestyle. We’re here to alleviate any reservations you may have and make sure that your floor buying process is as easy as walking on the floors once they’re installed. Carpet Corner offers only the finest flooring products at prices that are guaranteed to make the best bang out of your buck. We offer only top-quality products from some of the nation’s tops brands such as Shaw, Armstrong, and Bliss. We also have a wide variety of flooring types for you to choose from such as carpet, vinyl, hardwood, laminate, and stone and tile. Contact us today, and let’s get you the floor of your dreams!